If bone shrinks away from your teeth, it never grows back. In some cases, bone can be encouraged to fill in with grafting materials placed by Dr. Lankupalli and Dr. Patel. Every situation presents a different scenario, but more options than ever exist to promote bone repair in the jaw. For example, when a tooth needs removal, a large hole then exists in the bone. While it eventually should fill in naturally, the site tends to shrink, drawing bone away from the area and jeopardizing surrounding teeth. Grafting materials can be placed at the time of tooth removal to help preserve the existing bone level. 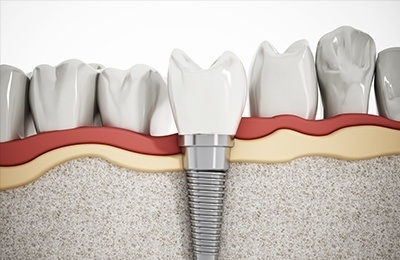 Bone grafts are especially beneficial if you are considering an implant-supported restoration in the future. Even areas that have already suffered bone collapse can often benefit from specialized grafting material, bolstering nearly any part of the jaw bone. It's important to note that bone destroyed by gum disease often leaves significant defects around teeth. While some of these areas are grafting candidates, many of them experience irreversible bone loss and compromised support of the teeth. Controlling gum disease with your ProSmiles Dental team will serve your health much better than corrective surgical grafts.